A public meeting is being held to debate plans for a new summer festival to replace the now-defunct Ashton Court event in Bristol. 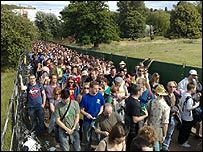 The Ashton Court Festival was held for the last time in 2007 after the organising company went bankrupt. Organisers of the new Bristol Festival hope it will become a South West version of the Edinburgh Fringe. The meeting is being held on 10 January at The Folk House on Park Street from 1900 GMT onwards. The group behind the festival is made up of volunteers and said it was open to new members and partnerships, and wanted an environmental feel to events. The festival, planned for a weekend later this year, will encompass various cultural activities across the city. It will include art exhibitions, workshops and educational talks as well as a night time programme of club nights and gigs.